Sabine Bimberg was born in 1985 in Magdeburg. After obtaining her A Levels she studied Domestic and Nutritional Science at the University of Applied Science in Bernburg. Already during her study she gained practical experience in the sensorial and analytical evaluation of food. Furthermore, an internship at the company Agrarmarketinggesellschaft Sachsen-Anhalt mbh provided her an insight in nutrition marketing. In her bachelor thesis, she focused on optimizing the production process of UHT milk at Nordmilch GmbH (today Deutsches Milchkontor GmbH, DMK). After having worked for several months in Ecuador she started her master studies at the Chrstian-Albrechts-University in Kiel. She completed her master studies in 2012. As a trainee at the company Friesenkrone GmbH und Co. KG Sabine collected experiences in product development of fish gourmet food and wrote her master thesis. 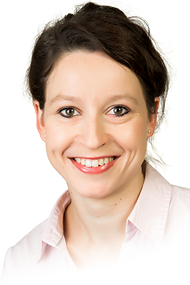 Since October 2012 Sabine Bimberg has been working as a Technical Service Manager for innotaste GmbH.